A new graphic compiled by Hilary Mason and Anna Smith of Bit.ly and Forbes Magazine’s Jon Bruner shows the popularity of different online news sites across the United States. The graphic uses data from Bit.ly, a link-shortening website. The team looked for unusually popular linked articles and compiled click-through information to create a color-coded map of the United States that shows the online news reporting preference of each state. Users can view an interactive version of the map that offers detailed information about each state. Clicking on any particular news source shows a breakdown of the most popular news stories and where those stories are popular. 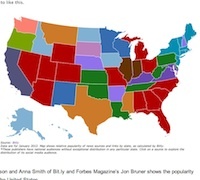 Web users can then use Bit.ly links to read the most popular articles in each state. The obvious bias of the graphic is that all of the data comes from Bit.ly. Bit.ly only tracks clicks from web users who use the service, of course, so the data is far from a complete representation of the United States’ online news consumption. Nevertheless, the limited data shows interesting geographical trends. For instance, Illinois and Indiana are the only two states that get most of their news from Illinois’ Chicago Tribune. 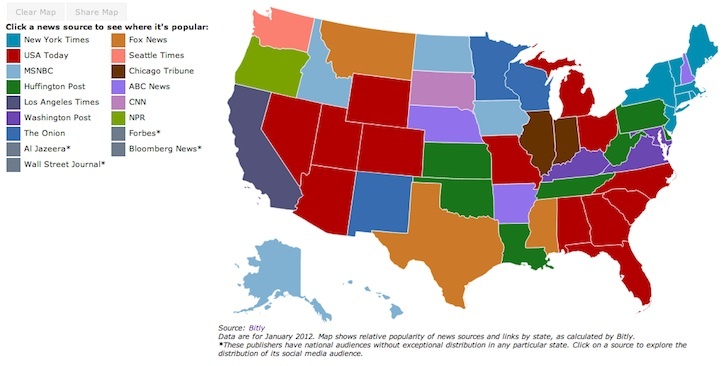 Fox News dominates in Texas, Montana and Mississippi, but otherwise makes no appearances on the map. USA Today is the most popular news source for Bitly users in 12 states including Florida and Nevada, while the New York Times’ reach is essentially confined to the East Coast. Perhaps most surprisingly, the satirical news site The Onion leads the pack in Wisconsin, Minnesota and New Mexico. 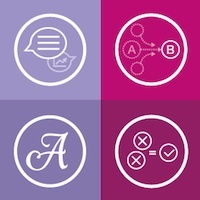 Bit.ly allows its users to find detailed usage by adding “+” to the end of a Bitly link. Bruner, Smith and Mason compiled an extraordinary amount of this same usage data to create the graphic. The map claims to use “millions of web clicks,” and Forbes says that it will update the map monthly to reflect new media trends.